He was old and frail and had a meek smile which showed his uneven teeth. He was the guard in the opposite office building. The first multi storey structure in our town, I often wondered how this man landed up with a job here. He was not a guard per say, just someone who opened the door for the people entering and exiting. He always greeted them politely with a smile but was always brushed aside. He was slow in his actions, considering his age and was often mistreated by the rushed masses. But he always wore his smile. We never spoke. Just a customary hello in the mornings, and a plate of Rice & Lentils that he ordered from me during the lunch hours, was our only interaction. He ate in quick small bites, almost gulping down the food and rushed back to his job. He seemed to love his job and that made me very curious. But at the end of the day earning my bread and butter was all that mattered to me, so I carried on ignoring the old man. It was a bright Monday morning, the day she came. The otherwise gloomy weather had turned radiant, with the Sun finally coming out after days of harsh rains. It seemed that the entire town stood still, only she moved gracefully, joyously, oblivious to the awed onlookers. As she entered the building, she paused and her pink lips moved to greet a perky hello to the old man. She saw in his eyes genuine kindness and an unsaid helplessness, which no one had noticed before. An instant comradeship struck between the two. Being constantly criticized for her bold appearance and outlook in the otherwise conservative town, singled out by women and ogled upon by men, she found solace in the old man's wise and non judgemental small world. And he finally had someone to talk to, who genuinely listened and cared. This was all that mattered to the both of them. Being respected and understood for the individuals they were. I benefited most out of this affinity. Their conversations over cups of masala tea and spicy eats, not only bulged up my pockets but swept me into whole new world of poetry and rhyme. The old man, nicknamed Dattu Chacha by the girl, was once an editor with the local newspaper of a nearby city. Loosing his wife at childbirth, he single handedly raised his son only to be abandoned by him in his old age. Never complaining, wearing his smile, he embraced Life with open arms, gaining strength from what he had known, from what he had loved. Poetry. One would think that the difficult times that he had lived must have left him bitter and faithless. That the years of doing every menial job from plumber to fruit seller to newspaper vendor to guard must have left him with no vigour to go on. But he got up each morning beaming at the opportunity to start a new day, to write a page more of his Life. One would presume that the heartbreak his Son caused, must have broken him. But he of all, gave us strength or more appropriately his words gave us strength. They had soul, hope for a better future for all of us. ....Whether these gave him courage or were meant for us lesser mortals we never did come to know. Seasons changed, their friendship grew and they both were now very much a part of my Life. I didn't realize their importance until that fated day. On a grey winter evening, I overheard Dattu Chacha saying to the girl, "Beti you have helped me find myself again. It was destined...our meeting". He looked into her huge kohled eyes, " I can see, you understand...this end is a new beginning". He handed over a huge bundle of neatly bound yellow pages, containing his words, his Universe. "Take care, my dear", he said. Dear readers: The story is not based on real events. 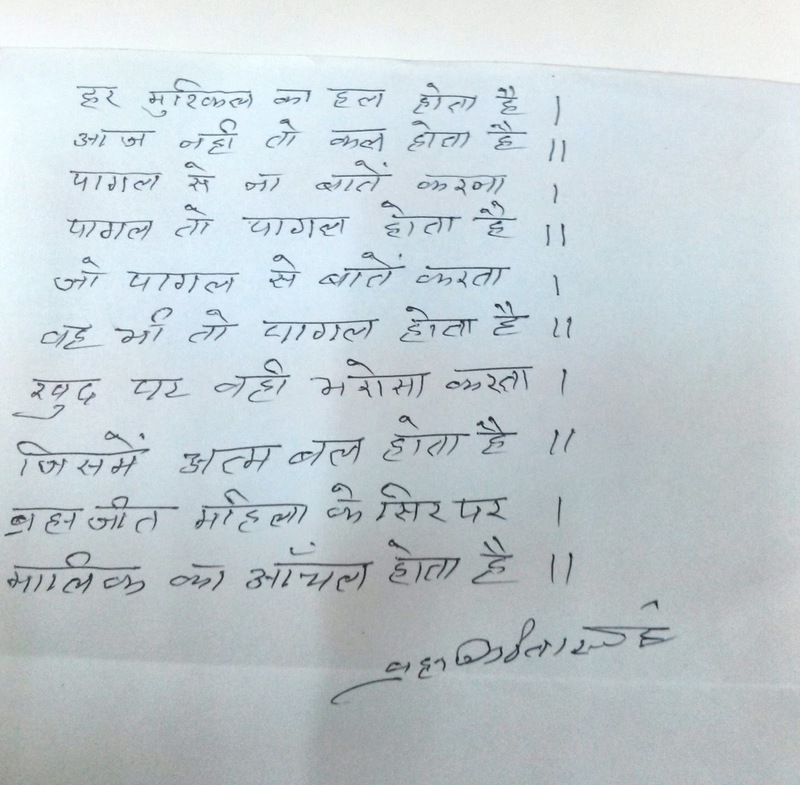 However, the character of Dattu Chacha is partly inspired by the man who wrote the above poem. He was a guard at the office adjacent to mine at my previous work place. Thanks a lot Harsha. Glad u enjoyed it! The trial and tribulations of the old man mentioned in the story are purely fiction. But yes, each one of us should try and live with that kind of spirit!! It's good Adi, i guess your very first attempt at fiction? Interesting! Hey welcome to my humble abode!! Thank you for your encouraging words, hope to see you around!! this is heart touching amazing read !! and I learnt one thing to move on because time will not stop and wont let you .. keep with the pace rather than complaining .!! Thanks so much!! N well said it's better to move on...always!! Very touchy story and well written Aditi,.